From bacon suits to flying buttresses made of dead hog. Here are some panels from Otto F. Fleiss' floridly titled pamphlet (deep breath) White Art in the Meat Food Business. 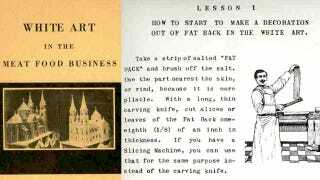 A Practical Handbook for Butcher, Pork Stores, Restaurants, Hotels and Delicatessens on How to Make Lasting and Transferable White Art Decorations out of Bacon Fat Back for Window Displays, Ornaments on Meat Food Cold Buffets and for Exhibits and Advertising Purposes. Enrich yourself with Personal Knowledge. And if that evocative title offered no clues, this pamphlet taught you how to construct consumer-enticing sculptures (like Santa Claus) out of "white art," or moldable lipids. Fleiss was no small expert at this art — that's his 200-pound pork fat cathedral above, which became "petrified" over time. If you're going with a centerpiece for your home, a crusty model church made of pig innards is most certainly the way to tie a room together. Hat tip to Ptak Science Books.